Vascular disease in patients with antiphospholipid syndrome: what do the cardiologists need to know? Article received on the 14th September 2012. Article accepted on the 26th October 2012. Prof. Dr. Coman Tănăsescu, MD, PhD, Department of Internal Medicine, Colentina Hospital, Ştefan cel Mare 19-21, 020125 Bucharest, Romania. Tel./Fax: +40 212107326. Abstract: Antiphospholipid syndrome (APS) is a clinical and laboratory condition associating arterial or venous thrombosis, obstetrical morbidity and positive antiphospholipid antibodies (aPL). A broad spectrum of cardiovascular manifestations was reported in patients with APS, focused mainly on thrombotic events. Recently, the vascular disease per se was described and discussed in these patients. The aim of this article is to review the spectrum of clinical and subclinical vascular abnormalities, mainly related to atherosclerosis, in patients with APS. Along with epidemiological and physiological data, the current status of therapy of patients with APS and atherosclerosis is also reviewed. The article emphasized also the need for a correct diagnostic of vascular events in patients with APS. Rezumat: Sindromul antifosfolipidic (APS) este o condiţie clinică şi de laborator ce asociază tromboze arteriale sau venoase, morbiditate obstetricală şi anticorpi antifosfolipidici pozitivi (APL). Un spectru larg de manifestări cardiovasculare a fost raportat la pacienţii cu APS, axat în principal pe evenimente trombotice. Recent, boala vasculară per se a fost descrisă şi discutată la aceşti pacienţi. Scopul acestui articol este de a revizui spectrul de anomalii clinice şi subclinice vasculare, în principal legate de ateroscleroză, la pacienţii cu APS. Împreună cu datele epidemiologice şi fiziologice, tratamentul actual al pacienţilor cu APS şi ateroscleroză este, de asemenea, revizuit. Acest articol subliniază de asemenea nevoia unui diagnostic corect a evenimentelor vasculare la pacienţii cu APS. Antiphospholipid syndrome (APS) is an acquired pro­thrombotic status in which recurrent arterial or venous thrombosis may coexist with obstetrical pathology and positive antiphospholipid antibodies (aPL)1. The disease is rare, occurring especially secondary to other clinical conditions as systemic lupus erythematosus (SLE) – secondary APS (SAPS). A broad spectrum of cardiovascular manifestations was reported in patients with APS, focused mainly on thrombotic events. 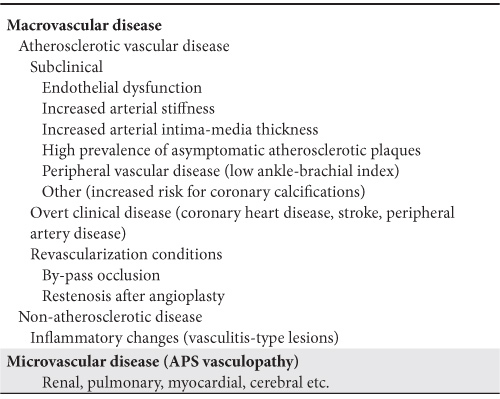 Recently, the vascular disease per se was described and discussed in these patients (Table 1). The aim of this article is to review the spectrum of clinical and subclinical vascular abnormalities, mainly related to atherosclerosis, in patients with APS. Endothelial dysfunction, an abnormal response of the vascular wall to vasodilator stimuli, represents a very early functional abnormality in the pathogenesis of atherosclerosis. There are several methods to assess it, used more for research purposes than in daily clinical practice. The most used is the flow-mediated dilatation (FMD) measurement at the level of brachial artery, but several biomarkers linked to endothelial dysfunction (i.e. von Willebrand factor) can also be used. An abnormal endothelial function was described in patients with other inflammatory rheumatic diseases2. There are reported data showing an endothelial impaired function in patients with APS3,4. Cugno et al.5 recently reported higher levels of von Willebrand factor levels and an impaired response at FMD test in pa­tients with APS compared to controls. Moreover, in this study the circulating endothelial cells were increased in patients with APS, with a significant reduction after antithrombotic treatment. A reduced FMD in patients with PAPS was reported by Bilora et al.6. Also, the impaired FMD in patients with PAPS was linked with the duration of the disease7, adhesion molecule levels (vascular-cell adhesion molecule-1 and intracellular adhesion molecule-1)7, with a significant reduction in patients with arterial disease comparing with those with venous disease8. Injection of antiphospholipid antibodies in mice was associated with an impaired relaxation response to acetylcholine of the mesenteric arteries9. However, there are other authors that reported similar values for endothelial function markers (FMD, von Willebrand factor, CD40L, soluble P-selectin, circulating endothelial cells) in patients with PAPS without other cardiovascular factors and controls, emphasizing the pure thrombotic mechanisms in APS10. Arterial stiffness is regarded now as an important cardiovascular risk marker11,12. However, the assessment of arterial stiffness in daily clinical practice, using techniques mainly based on pulse wave analysis, is not widely available. Data regarding the arterial stiffness in patients with PAPS are very limited. In patients with PAPS, arterial stiffness parameters correlate with decreased FMD, demonstrating the link between these functional abnormalities13. There are no differences regarding arterial stiffness between PAPS and SAPS patients14. In patients with lupus, carotid artery stiffness was not associated with the presence of the antiphos­pholipid antibodies15. Intima-media thickness (IMT), measured most fre­quently at the level of carotid artery, correlates with cardiovascular and cerebrovascular diseases16-19. There are several reports showing that IMT values are higher in patients with PAPS than controls20, linked to the age of patients21, memory T CD45RO+ cells22, factor XIII activity23, paraoxonase activity, as a marker of oxidative imbalance, and with IgG anti-β2 GPI-ox Lig-1 (7-ketocholesteryl-9-carboxynonanoate moiety of oxLDL) complex24. In a study that included both patients with PAPS and subjects with persistent titer of aCL with­out any underlying disease, Ames et al showed that IgG aCL independently predicted increased IMT at all carotid segments25. Belizna et al showed the increased prevalence for subclinical atherosclerotic carotid and femoral plaques (21%), independently predicted by the aCL titre15. Vlachoyiannopoulos reported an increased prevalence of carotid and femoral plaques in premenopausal women with APS compared to healthy controls or patients with rheumatoid arthritis26 without association with the levels of antiphospholipid antibodies. In the study of Jimenez et al.27, the prevalence of carotid plaques was not increased in patients with PAPS comparing with controls, but was higher in patients with SAPS with SLE than in patients with PAPS. Ankle-brachial index (ABI) identifies peripheral arterial disease of the lower limbs in asymptomatic individuals28. Baron et al. reported an increased prevalence for an abnormal ABI in patients with PAPS than controls, without any correlation with traditional cardiovascular risk factors29. A significant prevalence of an abnormal ABI was reported also in women with APS with pregnancy loss without thrombotic events30. Few reports are published regarding the presence of coronary calcifications in patients with PAPS. The risk for coronary calcifications, assessed by computed tomography was found to be increased in patients with SLE and positivity for aPL31. Typical signs of silent ischemic heart disease and myocardial infarction were reported with an increased prevalence in patients with APS using the cardiac magnetic resonance imaging32. The association between APS and coronary artery di­sease has been the subject of many controversies over the last years. Several important points have to be considered when discussing this association. Thrombus forma­ti­on, in situ or embolic thrombus, with the occlusion of the artery and subsequent ischemia is considered to be the main mechanism involved in acute vascular eve­nts in patients with APS (“thrombotic risk”). From this point of view, there are a large number of studies re­ga­rding the risk for acute thrombotic events in these pa­tients. However, more recently, the “atherosclerotic risk” in APS patients, leading to atherosclerosis plaque generation, became more and more discussed in the medical literature. As the plaque progresses, the specific symptoms may be present (i.e. stable angina, lower limbs claudication). According to this point of view, several case-reports and very few studies investigating the chronic atherosclerotic vascular diseases in patients with APS were published. A “combined” mechanism might involve thrombus generation on a pre-existent plaque, leading to acute events. We should note than studies regarding the aPL in patients with acute events, very rarely made the distinction between the “thrombotic risk” and “atherosclerotic risk”, as this is difficult, needing invasive intravascular imaging techniques (i.e. angiography or intravascular ultrasound). Otherwise, most of the studies used a single positivity for aPL, patients not having all criteria for APS, making the interpretation of the data more difficult. There are few cohorts of APS, mainly secondary to SLE, evaluating this risk. One of the largest cohorts is the Euro-Phospholipid cohort that includes 1000 patients with PAPS and SAPS. During the follow-up, the cumulative frequency of myocardial infarction was 5.5% and of angina was 2.7% and the cumulative frequency of stroke was 19.8%33. In this cohort 5.3% of the patients died during the follow-up; myocardial infarction (19%) and stroke (13%) were among the most common causes of death. The authors reported no clinical or immunological predictor for thrombotic events and death in patients with APS34. Farsi et al. reported an increased prevalence of anti-β2-GPI in pa­tients with ischemic heart disease comparing to healthy controls (29.7% vs 2.5%; p<0.005), with a significant difference between patients with unstable versus effort angina (45% vs 11.8%, p=0.03)35. In the same study the level of anti-β2-GPI was increase in patients with unstable angina versus stable angina and versus healthy controls. Vaarala et al demonstrated in a prospective cohort of healthy middle-aged men the value of high titer of aCL antibody as independent risk factor for myocardial infarction or cardiac death36. Similar data comes from the cohort of Honolulu Heart Program showing that aCL IgG, especially the β2-GPI-dependent, was an important predictor for stroke and myocardial infarction in men in a 20 years follow-up37. However, until now, these antibodies are not currently recommended in daily clinical practice for cardiovascular risk stratification. The positivity for aPL was associated with an unfavorable prognostic after coronary events38,39. However, the association between aCL and the risk of recurrent cardiovascular events in acute myocardial infarction survivors is controversial40-43. Zuckerman et al reported a high prevalence for aCL in young patients with acute myocardial infarction, high titers of these antibodies being predictive for recurrent myocardial infarction44. Other reports linked aCL with an increased risk for restenosis after angioplasty45-49 and with an earlier development of restenosis50. However, there are studies reporting no association between aCL and restenosis51. Morton et al reported an association between preoperative aCL level and the incidence of late graft occlusion in patients with coronary artery by-pass graft surgery52. Even if the absence of significant inflammatory lesions is mandatory for the diagnostic of APS, histological signs of vasculitis were reported in some patients with APS needing amputation53. The relevance of these lesions is not clear but inflammatory changes are in any case unspecific and discrete in patients with APS. The traditional cardiovascular risk factors failed to explain the cardiovascular excess morbidity in patients with APS54. Metabolic syndrome, as a cluster of cardiovascular risk factors, was found to have a similar prevalence in patients with APS and controls55. Taking into account the immune theory of atherosclerosis56, these mechanisms were studied in order to explain atherosclerotic lesions in APS, similarly to other inflammatory diseases57. The clear mechanisms by which the aPL are involved in the process of atherosclerosis are incompletely understood until now. One of the first steps in the pathogenesis of atherosclerosis is an abnormal endothelial function. Antiphospholipid antibodies were studied in this setting and several mechanisms were described linking them to endothelial dysfunction. The molecular structure of β2-GPI with a large positively charged domain is the key element in the interaction with negatively charged phospholipids from the endothelial cells membranes58. Another way to bind the β2-GPI to the endothelium is the annexin II, an endothelial cells receptor for tissue plasminogen activator (t-PA), which exhibits high affinity for β2-GPI (59). The anti β2-GPI antibodies recognize this β2-GPI attached on the surface of the endothelium shifting the function of endothelial to a pro-adhesive and pro-inflammatory phenotype60-65. An imbalance between prostacyclin and thromboxane A2, leading to a local prothrombotic status, was also reported as a consequence of direct APA binding to endothelial cells66. Apoptosis of the endothelial cells triggered by APA and the synthesis of vasoconstrictors as endothelin I are other mechanisms proposed to promote endothelial dysfunction in APS67. An important step in the atherosclerosis pathways in APS is the interaction between oxidized low density lipoprotein (ox-LDL), β2-GPI and anti- β2-GPI antibodies. Oxidized low density lipoprotein, an important component of foam cells and atherosclerotic lesions68, co-localizes with β2-GPI and lymphocytes69. β2-GPI binds ox-LDL, preventing the uptake and degradation of ox-LDL by macrophages. The ox-LDL/β2-GPI complexes might have a protective effect on vascular wall. The anti-β2-GPI antibodies bind the ox-LDL/β2-GPI complexes and facilitate the macrophage uptake of anti-β2-GPI/β2-GPI/ox-LDL complex, promoting foam cells development70. The antiphospholipid antibodies may impair the paraoxonase (antioxidant enzyme) leading to the synthesis of a high-density lipoprotein (HDL) with abnormal activity71. There are also reports in which the anticardiolipin antibodies were related with oxidative stress72. Heat-shock proteins were found in the atherosclerotic plaques and there are published data suggesting the association of IgG anti-hsp and IgA antiβ2-GPI with an increased risk for stroke73. A link between TNF-alpha, aPL (anticardiolipin, antibeta 2 GPI, anti-annexin A5) and anti-ox-LDL was found in patients with type 2 diabetes mellitus without vascular complications, characterizing a possible high atherogenic profile74. Until now, the clear mechanisms linking the aPL and APS to atherosclerosis are incomplete and controver­sial. There are some data from animal studies suggesting a protective effect on atherosclerosis of the aPL75,76. Vasculopathy is another name of so-called “thrombotic microangiopathy”, one of the most intriguing features of the APS. Most authors consider APS vasculopathy as having a primordial thrombotic mechanism and, secondarily and not in all cases, vasculitis fea­­tures77, with a good clinical response to antithrombo­tic treatment. The clinical importance of APS vasculopa­thy is at the level of several organs (i.e. kidneys, lungs, heart, brain etc. ), leading to specific manifestations. The main treatment in patients with thrombotic events is oral anticoagulation with antivitamin K with a target INR according to each clinical condition: arterial or venous thrombosis, first or recurrent event, obstetrical manifestations78. In some conditions, the supplementation with aspi­rin is advisable. Beyond the classical antiaggregant eff­ect, aspirin seems to have some other beneficial effects on endothelial cells in patients with APS79. Hydroxychloroquine was shown to have beneficial effects on cardiovascular risk profile in patients with rheumatoid arthritis80,81 and SLE82. Hydroxychloroquine have reported to have beneficial effects on thrombosis prophylaxis83,84 in patients with APS but consistent data concerning the positive effects on atherosclerosis are still lacking. However, the hydroxychloroquine may be used in patients with history of ischemic heart disease (angina, myocardial infarction) according to the recommendations of a consensus committee85. The use of statins in patients with APS might be attractive taking into account their reported pleiotropic effects86. There are controversial data regarding the beneficial effects of statins in animal models receiving aPL87-89. Until now, the use of statins in patients with APS must follow the recommendations for general po­pu­lation. Studies with statins in patients with APS are needed in order to have valid conclusions. There are no studies investigating the effects of different therapies on subclinical vascular function in pa­tients with APS. Regarding the corticosteroids and immunosuppressants, the data regarding the effects on atherosclerosis lesions in patients with APS are scarce. The screening for subclinical vascular disease in patients with APS should be driven according to recommendations existing for general population as there are not specific guidelines in patients with APS. Taking into account the availability of the IMT measurements in daily clinical practice, its assessment in patients with APS might be done, especially in those with SAPS or in the context of the presence of other cardiovascular risk factors. The individual assessment of cardiovascular risk must be done with cardiovascular risk scores, as SCORE chart proposed by European Society of Cardiology and other societies90. The data regarding the high risk for developing atherosclerosis lesions in patients with APS are still increasing. Along with the classical thrombotic risk, these patients may have atherosclerosis-related cardiovascular manifestations. Moreover, the entire spectrum of sub­clinical vascular disease was described in patients with APS. Clinicians should be aware of these manifestations and perform a complete cardiovascular risk assessment in these patients. In high risk patients and in patients with cardiovascular manifestations, treatment according to existing guidelines is advisable. The beneficial role of hydroxychloroquine and statins in patients with APS and cardiovascular morbidity related to athero­sclerosis is still a matter of debate. There are no conflicts of interests to be disclosed. Funding: This work was supported by CNCSIS-UEFISCSU, project number PNII – IDEI 2008 code ID_906 (contract 1227/2009). 1. Miyakis S, Lockshin MD, Atsumi T, Branch DW, Brey RL, Cervera R, et al. International consensus statement on an update of the classification criteria for definite antiphospholipid syndrome (APS). J Thromb Haemost 2006;4:295-306. 2. Tanasescu C, Jurcut C, Caraiola S, Nitescu D, Copaci I, Jurcut R. Endothelial dysfunction in inflammatory rheumatic diseases. Rom J Intern Med. 2009;47:103-108. 3. Der H, Kerekes G, Veres K, Szodoray P, Toth J, Lakos G, et al. Impaired endothelial function and increased carotid intima-media thickness in association with elevated von Willebrand antigen level in primary antiphospholipid syndrome. Lupus 2007;16:497-503. 4. Alexanderson E, Cruz P, Vargas A, Meave A, Ricalde A, Talayero JA, et al. Endothelial dysfunction in patients with antiphospholipid syndrome assessed with positron emission tomography. J Nucl Cardiol 2007;14:566-572. 5. Cugno M, Borghi MO, Lonati L, Ghiadoni L, Gerosa M, Grossi C, et al. Patients with antiphospholipid syndrome display endothelial perturbation. J Autoimmun 2010; 34:105-110. 6. Bilora F, Sartori MT, Zanon E, Campagnolo E, Arzenton M, Rosato A. Flow-mediated arterial dilatation in primary antiphospholipid syn­drome. Angiology 2009;60:104-107. 7. Stalc M, Poredos P, Peternel P, Tomsic M, Sebestjen M, Kveder T. Endothelial function is impaired in patients with primary antiphospholipid syndrome. Thromb Res 2006;118:455-461. 8. Mercanoglu F, Erdogan D, Oflaz H, Kucukkaya R, Selcukbiricik F, Gul A, et al. Impaired brachial endothelial function in patients with primary anti-phospholipid syndrome. Int J Clin Pract 2004;58:1003-1007. 9. Belizna C, Lartique A, Favre J, Gilbert D, Tron F, Levesque H, et al. Antiphospholipid antibodies induce vascular functional changes in mice: a mechanism of vascular lesions in antiphospholipid syndrome. Lupus 2008;17:185-194. 10. Gresele P, Migliacci R, Vedovati MC, Ruffatti A, Becattini C, Facco M, et al. Patients with primary antiphospholipid antibody syndrome and without associated vascular risk factors present a normal endothelial function. Thromb Res 2009;123:444-451. 11. Laurent S, Boutouyrie P, Asmar R, et al. Aortic stiffness is an independent predictor of all-cause mortality in hypertensive patients. Hypertension 2001;37:1236-1241. 12. Laurent S, Boutouyrie P. Arterial stiffness and stroke in hypertension; therapeutic implications for stroke prevention. CNS Drugs 2005; 19:1-11. 13. Soltesz P, Der H, Veres K, Laczik R, Sipka S, Szegedi G, Szodoray P. Immunological features of primary anti-phospholipid syndrome in connection with endothelial dysfunction, Rheumatology 2008;47: 1628-1634. 14. Belizna CC, Richard V, Primard E, Kerleau JM, Cailleux N, Louvel JP, et al. Early atheroma in primary and secondary antiphospholipid syn­drome: an intrinsic finding. Semin Arthritis Rheum 2008;37:373-380. 15. Farzaneh-Far A, Roman MJ, Lockshin MD, Devereux RB, Paget SA, Crow MK, et al. Relationship of antiphospholipid antibodies to cardiovascular manifestations of systemic lupus erythematosus. Arthritis Rheum 2006;54:3918-3925. 16. Bots ML, Hoes AW, Koudstaal PJ, Hofman A, Grobbee DE. Common carotid intima- media thickness and risk of stroke and myocardial infarction: the Rotterdam study.Circulation 1997;96:1432-1437. 17. Hodis HN, Mack WJ, LaBree L, Selzer RH, Liu CR, Liu CH, et al. The role of carotid arterial intima-media thickness in predicting clinical coronary events. Ann Intern Med 1998;128:262-269. 18. O’Leary DH, Polak JF, Kronmal RA, Manolio TA, Burke GL, Wolfson SK Jr. Carotid-artery intima and media thickness as a risk factor for myocardial infaction and stroke in older adults. Cardiovascular Health Study Collaborative Group N Eng J Med 1999; 340:14-22. 19. Rugina M, Ciobanu-Jurcut R, Jurcut C, Mihaila M, Apetrei E. Subclinical atherosclerosis, carotid intima-media thickness and the cardiovascular risk. Rom J Intern Med 2003;41:357-363. 20. Medina G, Casaos D, Jara LJ, Vera-Lastra O, Fuentes M, Barile L, et al. Increased carotid artery intima0media thickness may be associated with stroke in primary antiphospholipid syndrome. Ann Rheum Dis 2003;62:607-610. 21. Ames PR, Antinolfi I, Scenna G, Gaeta G, Margaglione M, Margarita A. Atherosclerosis in thrombotic primary antiphospholipid syn­drome. J Thromb Haemost 2009;7:537-542. 22. Ames PR, Tommasino C, Fossati G, Matsuura E, Margarita A, Saulino A, et al. Lymphocyte subpopulations and intima media thickness in primary antiphospholipid syndrome. Lupus 2005;14:809-813. 23. Ames PR, Iannacconne L, Alves JD, Margarita A, Lopez LR, Brancaccio V. Factor XIII in primary antiphospholipid syndrome. J Rheumatol 2005;32:1058-1062. 24. Ames PR, Delgado Alves J, Lopez LR, Gentile F, Margarita A, Pizzella L, et al. Antibodies against β2-glycoprotein I complexed with oxidized lipoprotein relate to intima thickening of carotid arteries in primary antiphospholipd syndrome. Clin Dev Immunol 2006;13:1-9. 25. Ames PR, Margarita A, Delgado Alves J, Tommasino C, Iannaccone L, et al. Anticardiolipin antibody titre and plasma homocysteine level independently predict intima media thickness of carotid arteries in subjects with idiopathic antiphospholipd antibodies. Lupus 2002;11: 208-214. 27. Jimenez S, Angels Garcia-Criado M, Tassies D, Reverter JC, Cervera R, Gilabert MR, et al. Preclinical vascular disease in systemic lupus erythematosus and primary antiphospholipid syndrome. Rheumatology (Oxford) 2005;44:756-761. 28. Greenland P. Abrams J, Aurigemma GP, Bond MG, Clark LC, Criqui MH, et al. Prevention conference V: beyond secondary prevention: identifying the high-risk patient for primary prevention: non-invasive test of atherosclerotic burden: Writing group III. Circulation 2000; 101:e16-22. 29. Baron MA, Khamashta MA, Hughes GR, D’Cruz DP. Prevalence of an abnormal ankle-brachial index in patients with primary antiphospholipid syndrome: preliminary data. Ann Rheum Dis 2005;64:144-146. 30. Christodoulou C, Zain M, Bertolacci ML, Sangle S, Khamashta MA, Hughes GR, et al. Prevalence of an abnormal ankle-brachial index in patients with antiphospholipid syndrome and pregnancy loss but not thrombosis: a controlled study. Ann Rheum Dis 2006;65:683-684. 31. Plazak W, Pasowicz M, Kostkiewicz M, Podolec J, Tomkiewicz-Pajak L, Musial J, et al. Influence of chronic inflammation and autoimmuni­ty on coronary calcifications and myocardial perfusion defects in sys­­temic lupus erythematosus patients. Inflamm Res 2011;60:973-980. 32. Sacré K, Brihaye B, Hyafil F, Serfaty JM, Escoubet B, Zennaro MC, et al. Asymptomatic myocardial ischemic disease in antiphospholipid syndrome: a controlled cardiac magnetic resonance imaging study. Arthritis Rheum. 2010;62:2093-2100. 33. Cervera R, Boffa MC, Khamashta MA, Hughes GRV. The Euro-Phospholipid project: epidemiology of the antiphospholipid syndrome in Europe. Lupus 2009;18:889–893. 34. Cervera R, Khamashta MA, Shoenfeld Y, Camps MT, Jacobsen S, Kiss E, et al. Morbidity and mortality in the antiphospholipid syndrome du­ring a 5-year period: a multicentre prospective study of 1000 pa­tients. Ann Rheum Dis 2009;68:1428-1432. 35. Farsi A, Domeneghetti MP, Fedi S, Capanni M, Giusti B, Marcucci R, et al. High prevalence of anti-beta2 glycoprotein I antibodies in pa­tients with ischemic heart disease. Autoimmunity 1999;30:93-98.
et al. Anti-cardiolipin antibodies and risk of myocardial infarction in a prospective sohort of middle-aged men. Circulation 1995;91:23-27. 37. Brey RL, Abbott RD, Curb JD, Sharp DS, Webster Ross G, Stallworth CL, et al. Beta(2)-glycoprotein 1–dependent anticardiolipin antibodies and risk of ischemic stroke and myocardial infarction the Honolulu Heart Program. Stroke 2001;32:1701-1706. 38. Greco TP, Conti-Kelly AM, Anthony JR, Greco T Jr, Doyle R, Matsuura E, et al. Oxidized newer antiphospholipid antibodies predict adverse outcomes in patients with acute coronary syndrome. Am J Clin Pathol 2009;132:613-620. 39. Bili A, Moss AJ, Francis CW, Zareba W, Miller Watelet LF, Sanz I. Anticardiolipin antibodies and recurrent coronary events: a prospective study of 1150 patients. Thrombogenic Factors and Recurrent Coronary Events Investigators. Circulation 2000;102:1258-1263. 40. Hamsten Ai Norberg R, Bjorkholm M, de Faire U, Holm G. Antibod­ies to cardiolipin in young survivors of myocardial infarction: an as­­sociation with recurrent cardiovascular events. Lancet 1986;1:113-116. 41. Sletnes KE, Smith P, Abdelnoor N, Arnesen H, Wisloff F. Antiphospholipid antibodies after myocardial infarction and their relation to mortality, reinfarction, and non-hemorrhagic stroke. Lancet 1992; 339:451-453. 42. Cortellaro M, Boschetti C, Cardillo M, Barbui T. Antiphospholipid antibodies in patients with previous myocardial infaction. Lancet 1992;339:929-930. 43. Phadke KV, Phillips RA, Clarke DT, Jones M, Naish P, Carson P. Anticardiolipin antibodies in ischemic heart disease: marker or myth? Br Heart J 1993;69:391-394. 44. Zuckerman E, Toubi E, Shiran A, Sabo E, Shmuel Z, Golan TD, et al. Anticardiolipin antibodies and acute myocardial infarction in non-systemic lupus erythmatosus patients: a controlled prospective study. Am J Med 1996;101:381-386. 46. Eber B, Schumacher M, Auer-Grumbach P, Toplak H, Klein W. In­creased IgM-anticardiolipin antibodies in patients with restenosis after percutaneous transluminal coronary angioplasty. Am J Cardiol 1992; 69:1255-1258. ­luminal coronary angioplasty. Atherosclerosis 2001;154:129-135. 49. Gavaghan TP, Krilis SA, Daggard GE, Baron DE, Hickie JB, Chesterman CN. Anticardiolipin antibodies and occlusion of coronary bypass grafts. Lancet 1987;2:977-978. 51. Sharma S, Malhotra A, Sharma YP, Pandhi P, Malhotra S, Nageswari KS, et al. Association of anticardiolipin antibodies levels with instent restenosis in patients with coronary artery disease. Indian J Physiol Pharmacol 2008;52:288-292. 52. Morton KE, Gavaghan TP, Krilis SA, Daggard GE, Baron DW, Hickie JB, et al. Coronary artery bypass graft failure–an autoimmune phenomenon? Lancet 1986;2:1353-1357. 53. Asherson RA, Cervera R, Klumb E, Stojanovic L, Sarzi-Puttini P, Yinh J, et al. Amputation of digits or limbs in patients with antiphospholipid syndrome. Semin Arthritis Rheum 2008;38:124-131. 54. Soltész P, Kerekes G, Dér H, Szücs G, Szántó S, Kiss E, et al. Comparative assessment of vascular function in autoimmune rheumatic diseases: considerations of prevention and treatment. Autoimmun Rev 2011;10:416-425. 55. Medina G, Gutiérrez-Moreno AL, Vera-Lastra O, Saavedra MA, Jara LJ. Prevalence of metabolic syndrome in primary antiphospholipid syndrome patients. Autoimmun Rev 2011;10:214-217. 57. Hahn BH, Grossman J, Chen W, Mc Mahon M. The patogenesis of atherosclerosis in autoimmune rheumatic disease: roles of inflammation and dyslipidemia. J Autoimmun 2007;28:69-75. 58. Bouma B, de Groot PG, van den Elsen JM, Ravelli RB, Schouten A, Simmelink MJ,, et al. Adhesion mechanism of human β2-glyvoprotein I to phospholipidis based on its crystal structure. EMBO J 1999;18: 5166-5174. 60. Del Papa N, Guidali L, Spatola L, Bonara P, Borghi MO, Tincani A, et al. Relationship between anti-phospholipid and anti-endothelial antibodies III: β2-glycoprotein I mediates the antibody binding to endothelial membranes and induces the expression of adhesion molecules. Clin Exp Rheumatol 1995;13:179-186. 61. Simantov R, LaSala JM, Lo SK, Gharavi AE, Sammaritano LR, Salmon JE, et al. Activation of cultured vascular endothelial cells by antiphos­pholipid antibodies. J Clin Invest 1995;96:2211-2219. 62. Le Tonquèze M, Salozhin K, Dueymes M, Piette JC, Kovalev V, Shoenfeld Y, et al. Role of β2-glycoprotein I in the anti-phospholipid antibody binding to endothelial cells. Lupus 1995;4:179-186. 63. Del Papa N, Guidali L, Sala A, Buccellati C, Khamashta MA, Ichikawa K,, et al. Endothelial cells as target for antiphospholipid antibodies. Hu­man polyclonal and monoclonal anti-beta 2-glycoprotein I anti­bodies react in vitro with endothelial cells through adherent beta 2-glycoprotein I and induce endothelial activation.. Arthritis Rheum 1997;40:551-561. 64. George J, Blank M, Levy Y, Meroni P, Damianovich M, Tincani A, et al. Differential effects of anti-β2 glycoprotein I antibodies on endothelial cells on the manifestations of the experimental antiphospholipid syndrome. Circulation 1998;97:900-906. 65. Cho CS, Cho ML, Chen PP, Min SY, Hwang SY, Park KS, et al. Antiphospholipid antibodies induce monocyte chemoattractant protein-1 in endothelial cells. J Immunol 2002;168:4209-4215. 66. Carreras LO, Vermylen JG. Lupus anticoagulant and thrombosis: possible role of inhibition of prostacyclin formation. Thromb Haemost 1992;48:38-40. 67. Meroni PL, Raschi E, Testoni C, Tincani A, Balestrieri G. Antiphospholipid antibodies and the endothelium. Rheum Dis Clin North Am 2001;27:587-602. 68. Yla-Herttuala S, Palinski W, Rosenfeld ME, Parthasarathy S, Carew TE, Butler S, et al. Evidence for the presence of oxidatively modified low density lipoprotein in atherosclerotic lesions of rabbit and man. J Clin Invest 1989;84:1086-1095. 69. George J, Harats D, Gilburd B, Afek A, Levy Y, Schneiderman J, et al. Immunolocalization of beta2-glycoprotein I (apolipoprotein H) to human atherosclerotic plaques: potential implications for lesion progression. Circulation 1999;99:2227-2230. 70. Hanusuma Y, Matsuura E, Makita Z, Katahira T, Nishi S, Koike T. Involvement of β2-glyprotein I and anticardiolipin antibodies in oxidatively modified low-density lipoprotrein uptake by macrophages. Clin Exp Immunol 1997;107:569-573. 71. Charakida M, Besler C, Batuca JR, Sangle S, Marques S, Sousa M, et al. Vascular abnormalities, paraoxonase activity, and dysfunctional HDL in primary antiphospholipid syndrome. JAMA 2009;302;1210-1217. 72. Alves JD, Grima B. Oxidative stress in systemic lupus erythematosus and antiphospholipid syndrome: a gateway to atherosclerosis. Curr Rheumatol Rep 2003;5:383-390. 73. Staub HL, Norman GL, Crowther T, da Cunha VR, Polanczyk A, Bohn JM, et al. Antibodies to the atherosclerotic plaque components beta2 glycoprotein I and heat shock proteins as risk factors for acute cerebral ischemia. Arq Neuropsiquiatr 2003;61:757-763. 74. Becarevic M, Seferovic J, Ignjatovic S, Singh S, Majkic-Singh N. Significant association of antiphospholipid antibodies and TNF-alpha: Marker of severe atherogenic profile of patients with type II diabetes mellitus withoutmicro and/or macrovascular complications. Cytokine 2011;55301–306. 75. Nicolo D, Goldman BI, Monestier M. Reduction of atherosclerosis in low-density lipoprotein receptor-deficient mice by passive administration of antiphospholipid antibody. Arthritis Rheum 2003;48:2974-2978. ­pression of early atherosclerosis in LDL-receptor deficien mice by oral tolerance with beta 2-glycoprotein I. Cardiovasc Res 2004;62:603-609. 77. Lie JT. Vasculopathy of the antiphospholipid syndromes revisited: thrombosis is the culprit and vasculitis the consort. Lupus. 1996;5: 368-371. 78. Crowther MA, Wisloff F. Evidence based treatment of the antiphos­pholipid syndrome II. Optimal anticoagulant therapy for thrombosis. Thromb Res 2005;115:3-8. G, Moerloose P. Aspirin inhibits endothelial cell activation induced by antiphospholipid antibodies. Thromb Haemost 2004;2:1176-1181. 80. Bili A, Sartorius JA, Kirchner HL, Morris SJ, Ledwich LJ, Antohe JL, et al. Hydroxychloroquine use and decreased risk of diabetes in rheumatoid arthritis patients. J Clin Rheumatol 2011;17:115-120. 81. Morris SJ, Wasko MC, Antohe JL, Sartorius JA, Kirchner HL, Dancea S, et al. Hydroxychloroquine use associated with improvement in lipid profiles in rheumatoid arthritis patients. Arthritis Care Res (Hoboken) 2011;63:530-534. 82. Roman MJ, Shanker BA, Davis A, Lockshin MD, Sammaritano L, Simantov R, et al. Prevalence and correlates of accelerated atherosclerosis in systemic lupus arythematosus. N Engl J Med 2003;349;2399-2406. 83. Barbhaiya M, Erkan D. Primary thrombosis prophylaxis in antiphos­pholipid antibody-positive patients: where do we stand? Curr Rheumatol Rep 2011;13:59-69. 84. Szymezak J, Ankri A, Fischer AM, Darnige L. Hydroxychloroquine: a new therapeutic approach to the thrombotic manifestations of antiphospholipid syndrome. Rev Med Interne 2010;31:854-857. 85. Lockshin M, Tenedios F, Petri M, McCarty G, Forastiero R, Krilis S, et al. Cardiac disease in the antiphospholipid syndrome: recommenda­ti­ons for treatment. Committee consensus report. Lupus 2003;12:518-523. 86. Belizna CC, Richard V, Thuillez C, Levesque H, Shoenfeld. Insights into atherosclerosis therapy in antiphospholipid syndrome. Autoimmun Rev 2007;7:46-51. 87. Ferrara DE, Liu X, Espinola RG, Meroni PL, Abukhalaf I, Harris EN, et al. Inhibition of the thrombogenic and inflammatory properties of antiphospholipid antibodies by fluvastatin in an in vivo animal model. Arthritis Rheum 2003;48:3272-3279. 88. Meroni PL, Raschi E, Testoni C, Tincani A, Balestrieri G, Molteni R, et al. Statins prevent endothelial cell activation induced by antiphospholipid (anti-beta2-glycoprotein I) antibodies: effect on the proadhesive and proinflammatory phenotype. Arthritis Rheum 2001;44:2870-2878. 89. Dunoyer-Geindre S, Dimitrova Y, Fish RJ, Satta N, Reber G, Kruithof EK, et al. Fluvastatin increases the expression of adhesion molecules, monocyte chemoattractant protein-1 and tissue factor in HUVEC stimulated by patient IgG fractions containing antiphospholipid antibodies. Thromb Haemost 2005;93:339-345. 90. Graham I, Atar D, Borch-Johnsen K, Boysen G, Burell G, Cifkova R, et al. European guidelines on cardiovascular disease prevention in clinical practice: executive summary. Fourth Joint Task Force of the European Society of Cardiology and other societies on cardiovascular disease prevention in clinical practice (constituted by representatives of nine societies and by invited experts). Eur J Cardiovasc Prev Rehabil. 2007;14 Suppl 2:E1-40.